The Western New York Land Conservancy is excited to announce the start of new international Design Ideas Competition for the DL&W corridor. Professional and student designers, architects, landscape architects, urban planners and artists are invited to submit their visionary concepts to transform the abandoned 1.5-mile elevated DL&W rail corridor connecting Buffalo’s downtown with its waterfront through three distinct and historic neighborhoods. The competition is the next step in reimagining this former industrial space as a multi-use urban nature trail and greenway. It follows the work of community leaders, residents, planners and advocates who have championed the potential of this site for years. And it also follows on the heels of a year-long community visioning process that resulted in a published community vision plan that will guide the future of the DL&W corridor. The corridor is owned by the Niagara Frontier Transportation Authority (NFTA). Competition winners will be selected by a jury of community leaders and local, national and international experts in planning, design, community development, public art, architecture and urban trail projects like New York City’s High Line and Toronto’s Bentway. The proposals will be revealed on the Land Conservancy’s website and at several public exhibitions this spring. In addition to three winners selected by the jury, the community will also be able to select their favorite proposal. The winners will receive monetary awards ranging from $1,000 to $7,500. “The design community has an incredible opportunity to bring forth their best ideas to transform this abandoned post-industrial landscape into the vibrant and interconnected public green space that the community is asking for,” said Ken Greenberg, one of the jury members. Ken also helped launch and design the Bentway project in Toronto. “I have seen projects revitalize communities all over the country. As members of the jury, we will evaluate and make recommendations about each of the innovative ideas for this new public space based on the community’s vision for this corridor,” says Ana Traverso-Krejcarek, another juror. Ana is a Bolivian-American sociologist and urban planner. At the High Line Network, Ana works with industrial reuse organizations and projects creating a new generation of public spaces. Kishore Varanasi, director of Urban Design and Principal at cbt, is the competition adviser for the Land Conservancy. Anthony Armstrong, principal at Make Communities, is the community engagement consultant and project manager. M&T Bank was the first to support the competition, and their early leadership was the spark that made the competition possible. “Western New York is an incredible place to live and work. This project will contribute to our region’s renaissance by connecting people to our waterfront, our historic neighborhoods and downtown. We are proud to partner with the community on this transformative work,” said Shelley C. Drake, Western New York Regional President at M&T Bank. In addition to M&T Bank, the competition is also made possible through the generous support from Blue Fund of BlueCross BlueShield of Western New York, the Ralph C. Wilson, Jr. Legacy Funds at the Community Foundation for Greater Buffalo, New York State Department of Environmental Conservation and the Land Trust Alliance, Rails-to-Trails Conservancy through the Doppelt Family Trail Development Fund, and numerous individual Land Conservancy members and donors. More detailed information about the Design Ideas Competition, including the Competition Brief with goals and intended outcomes, can be found on the Land Conservancy’s website at www.wnylc.org/dlw-design. Those wishing to participate in the competition must register by emailing dlw@wnylc.org. There is no cost to participate. Submissions are due by Feb. 15, 2019. Winners will be announced this spring. If you are interested in learning more about the Western New York Land Conservancy, contact the office at (716) 687-1225 or info@wnylc.org. If you would like to support the DL&W project or the Land Conservancy’s conservation work, you can donate online at www.wnylc.org or send a check to P.O. Box 471, East Aurora, N.Y. 14052. The Western New York Land Conservancy is a regional, not-for-profit land trust that permanently protects land with significant conservation value in Western New York for current and future generations. The Land Conservancy envisions a future in which open spaces, working lands, wildlife habitat and scenic beauty are cherished and protected as part of the landscape and character of Western New York. The Land Conservancy is accredited by the Land Trust Accreditation Commission and is one of 1,000+ land trusts nationwide, including 90 in New York State. Land trusts have protected 56 million acres of land. About M&T Bank – M&T Bank is a financial holding company headquartered in Buffalo. M&T’s principal banking subsidiary, M&T Bank, operates banking offices in New York, Maryland, New Jersey, Pennsylvania, Delaware, Connecticut, Virginia, West Virginia and the District of Columbia. Trust-related services are provided by M&T’s Wilmington Trust-affiliated companies and by M&T Bank. About BlueCross BlueShield of Western New York – BlueCross BlueShield of Western New York is a division of HealthNow New York Inc., an independent licensee of the Blue Cross and Blue Shield Association. Since 1936, BlueCross BlueShield has helped millions of people lead healthier lives. BlueCross BlueShield offers a full range of insured, self-insured, and government programs and services covering businesses, families and individuals, as well as dental and vision plans and stop-loss coverage. As a community-based, not-for-profit health plan, BlueCross BlueShield contributes significantly to organizations that strengthen and enrich the health of our community. For up-to-date news, facts and information about the company, leadership and industry, please visit the BlueCross BlueShield News Center at bcbswny.com/news or follow the company on Twitter. About Blue Fund – Blue Fund, funded solely by BlueCross BlueShield of Western New York, awards major grants in Western New York, totaling approximately $1 million to $3 million annually, to organizations and initiatives that have a positive impact on key health areas and will demonstrate enhanced measurable outcomes for community health metrics. These include behavioral health, cardiovascular health, diabetes, health care workforce development, healthy children and the opioid epidemic. Blue Fund complements BlueCross BlueShield’s current corporate giving program of partnerships and sponsorships which saw community investments of more than $2 million in Western New York in 2017. About the Ralph C. Wilson, Jr. Legacy Funds at the Community Foundation for Greater Buffalo – The Community Foundation for Greater Buffalo, a 501 (C) (3) organization, was established in 1919 to enhance and encourage long-term philanthropy in the Western New York community. The Foundation’s mission is: Connecting people, ideas and resources to improve lives in Western New York. For nearly 100 years, the Community Foundation has made the most of the generosity of individuals, families, foundations and organizations who entrust charitable assets to its care. The Ralph C. Wilson, Jr. Legacy Funds were established at the Community Foundation to provide support to four areas that were important to Mr. Wilson: caregivers, community assets, design and access, and youth sports. Endowment funds, like these created to honor Mr. Wilson, are designed to grow over time and provide funding for charitable causes according to a client’s wishes. Visit www.cfgb.org for more information. The project was supported with funding from the New York State Conservation Partnership Program (NYSCPP) and New York’s Environmental Protection Fund. The NYSCPP is administered by the Land Trust Alliance, in coordination with the state Department of Environmental Conservation. Rails-to-Trails Conservancy is the nation’s largest trails organization—with a grassroots community more than one million strong—dedicated to connecting people and communities by creating a nationwide network of public trails, many from former rail lines. Established by RTC in 2015, the Doppelt Family Trail Development Fund is a way to move forward critical projects that enhance health and transportation connectivity in their regions. Connect with RTC at railstotrails.org and @railstotrails on Facebook, Twitter and Instagram. 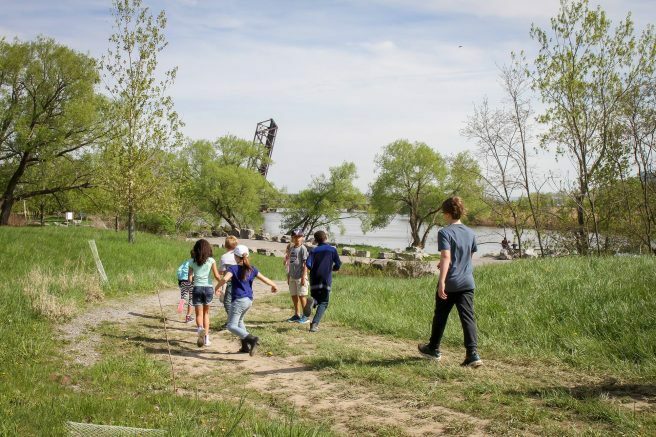 Be the first to comment on "Land Conservancy kicks off international design ideas competition for DL&W trail and greenway"